Páscoa,Pascua, Pasqua,Pashka..... Most of the regional names of Easter have been derived from the Latin and Greek word ‘Pascha’ or Hebrew ‘Pesach’ meaning Passover. English speaking countries term the day of the feast ‘Easter’ and German speaking tongues refer to the festive day as ‘Ostern’. Both these terms seem have come from the name of an ancient goddess known as Eostre. After forty days and forty nights of undefiled fasting in the wild,you´d not only be starving but tempted and craving the most delicious hot fudge sundae ever.Having given up that latte and chocolate muffin, where were you forced to turn in order to survive those Monday mornings at work? Well look no further. Dog days are over,the humdrum drudgery's done and now its time to let the good times roll! But be quick! Indulge while you can and enjoy every moment.Now its time to let your heart beat faster and your cholesterol levels run wild.Last Easter I entreated you to make monkey bread and this year your Easter treat is going to be an indulgent Pashka (or Paskha)that is something that would bring back the smile to the face of any Czar or Czarina. 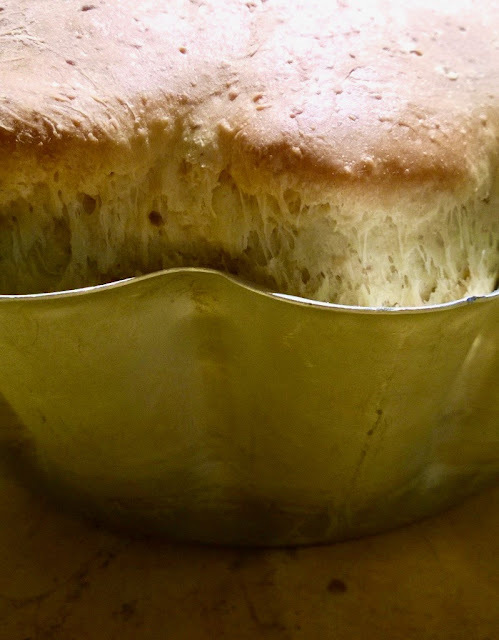 Pashka is essentially a crustless cheesecake that is served in Russian homes for Easter. It is traditionally made during Easter week, and brought to church for blessing on Easter Saturday,before being served on Easter Sunday. Traditional Pashka is made from a type of farm house cheese or curd cheese called tvorog. 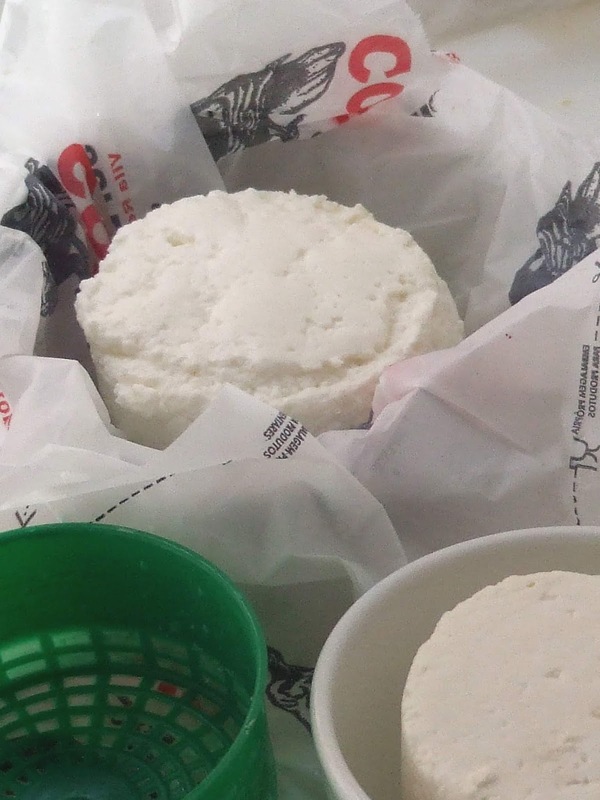 Cottage cheese and ricotta cheese are similar and can be used instead. It’s combined with rich ingredients like cream, butter and eggs and then sweetened with sugar, dried fruit and nuts. This dish is usually heavy on dairy, but I’ve lightened it up by using ricotta with only a small addition of yoghurt.Recipes for this right royal dessert vary from region to region and home to home. Variations can be found throughout the Eastern Orthodox world. The taste, no matter what recipe is used, is extraordinary. It is often moulded into the shape of an egg, crown or pyramid. Pashka is sometimes made with simple fruit and nuts or with more complicated mixtures of dried fruits and nuts. My loose interpretation encompasses many of those different styles and tastes.Pashka is for life not just for Easter.I feel like I´ve just died and gone to heaven.That is what happens at Easter isn´t it? you can have it for breakfast too.There´s a thing!!! In a medium frying pan, cook almond flakes over medium heat for 1-2 minutes, until light browned/toasted. Stir frequently to prevent burning. Set aside. Put the mascarpone and ricotta in a mixing bowl. Put the egg yolks and honey in a food mixer and beat till thick and pale. Pour the cream into a saucepan and bring to just boiling point. Pour the cream into the eggs and honey beating continuously. Pour the egg custard into the saucepan in which you heated the cream and warm, gently and stirring regularly, until the mixture is hot, but far from boiling. Stir regularly, adding the vanilla extract, a drop or two should be enough, as you go. Stir the dried apricots, candied peel,blueberries,raspberries finely grated orange and lemon zest, the flaked and ground almonds and the yoghurt into the cream cheese. 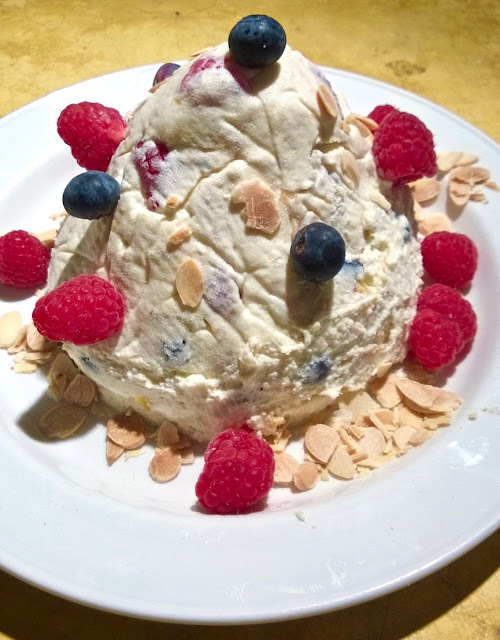 Reserve a few whole raspberries and blueberries for decoration at the end.When the custard is hot, pour it into the cream cheese and ricotta and fold everything gently together with a large spoon or rubber spatula. Mix lightly but thoroughly. Line a large sieve with muslin or a new J-cloth, then suspend it over a bowl. Scrape the cream cheese mixture into the lined sieve, fold the overhanging fabric over the top and refrigerate overnight. The mixture will set and some of the liquid will sip out through the bottom. To serve, remove pashka carefully from the sieve and peel away the muslin cloth. The easiest way to do this is to tip the sieve upside down on to a plate and then pull it off and peel the muslin off. Garnish with extra almond flakes and raspberries and blueberries on top. Serve with more yoghurt and extra honey if you like. Oh how the madcap laughed.Ha!! Peanut flavoured brioche? an earthy intrigue and an even more velvety texture. My post natal reaction to past bread baking endeavours has been to yell "I am as mad as hell and I am not going to "bake" this anymore.Redolent of Howard Beale the news anchor man in the movie Network.It is always a bread making breakdown that triggers this rant. However I have now finally achieved redemption through anger in the form of brioche baking.I have always loved brioche but did not realise just how easy it would be to make (once mastered!!!! 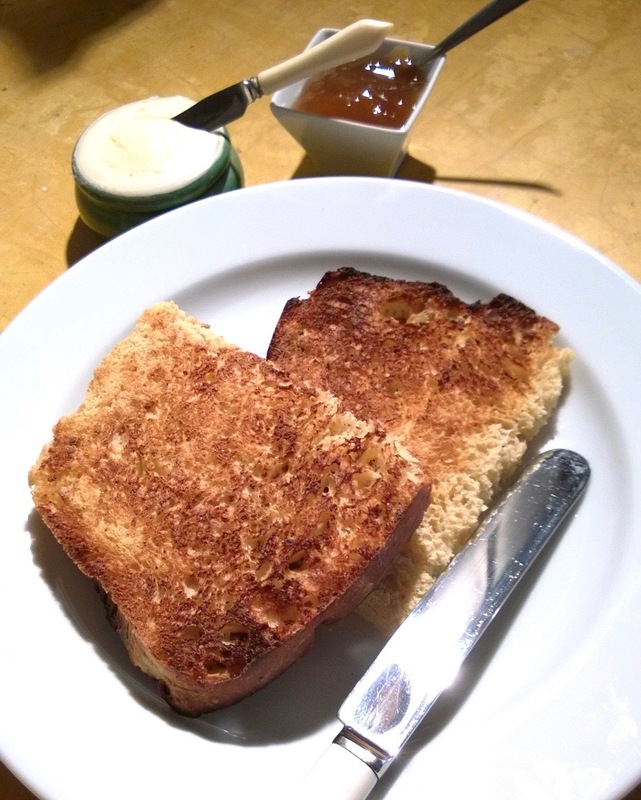 ), easy to tweak, and great for almost anything: on it's own, smeared with almost anything, toasted, as a substitute for hamburger buns, grilled with cheese, toasted for bread pudding, or just left to dry out and get stale for croutons or crumb.It is a basic bread that includes egg, butter, and milk to give an even and smooth texture and flavour. The higher the egg/butter content, the fluffier and more pastry like. The pores in the bread are smaller and almost looks like the cross-section slice of cake. Well I have been playing Mad Baker-Scientist and introducing peanuts into the brioche equation.I have to say it did not get off to a good start with what appeared to be a bowl of brown soup.I soon realised the proportion of flour in the basic brioche recipe I was following had omitted a nought.25g of flour should have read 250g.Bring back subs I say,particularly where recipes are concerned.Are recipes not subjected to the test kitchen process these days? I can assure you all mine are before I post them.Back on track I achieved the very soft,elastic,very smooth and shiny dough I knew I should be striving for.But then what appeared to be a scientific phenomenom occurred. "Phenotype"came to mind.The term "phenotype" refers to the observable physical properties of an organism; these include the organism's appearance, development, and behaviour.At first I thought I had given birth to a mutant loaf,my dough had all the characteristics of a living thing.It rose and rose as it proved and the only way I could suppress it would be by puncturing it,like a sheep with colic. I quickly turned on the oven and put my brioche form in before it ran across the floor like an alien obsessed.30 minutes later I opened the oven door and was presented with the most delicious looking brioche loaf ever.It had a sophisticated,subtle background note with the peanut flavour coming through with a strong finish.Epiphany achieved, the alien predator was finally held at bay and warrant officer Ripley became enlightened and ready for a French breakfast. 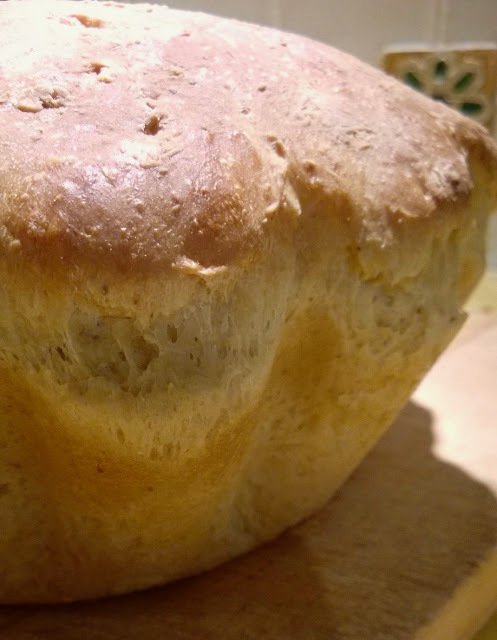 Disclaimer /abdicar de direitos:One word of warning before starting to bake.The dough may seem a little on the liquid side and so gradually add more flour in stages until you have achieved a workable soft but elastic dough for kneading. Mix everything together in a bowl.Turn out onto a floured board and knead for about 6 minutes.Transfer the dough to a lightly oiled container covered with plastic wrap and allow a bulk fermentation time of 1 hour in a warm draft-free place.The dough should have doubled in size.If you have time place the dough in the refrigerator overnight.This makes the dough easier to work with and mould.Otherwise place the dough in an oiled 9" (22cm) brioche form and bake in a preheated oven 180c for 30 minutes.allow to cool in tin before removing. Perfect for introducing a friend to great Portuguese food. This is my modern take on a rich luncheon dish,originally made famous in the province of Estramadura.Historically in Lisbon there used to be a variety of small restaurants specializing in this dish,all putting their own particular stamp on it.Alas, they do not seem to have survived,but you can still find the dish at many establishments one in particular taberna da rua das flores, and failing that it is easy enough to prepare at home.I have always wanted to try this but was put off by the way it was presented on the plate at any of the restaurants where it was on the menu.It looked so unappetising to me,so I thought how can we give this classic Portuguese dish a makeover. The traditional main constituents of the dish that keep strictly to early 20th-century principles are bacalhau,chickpeas ,hard boiled eggs ,olives.It is usually dressed with olive oil,parsley and vinegar.Other seasonings are sometimes included,colorau or smoked paprika being one of the commonest along with onions and garlic. For this version here I have made some changes(mostly in the presentation of the dish) like making a base for the salad to rest on in the form of a chickpea cake. Boil the quails eggs for 2-3 minutes the rinse under cold water.When cool,with the help of a sharp pointed knife remove the shells and set the eggs aside. Chop the onion and garlic and parsley and radishes,combine with the lemon juice olive oil and vinegar to make a chunky dressing.add the olives and set aside. Place the cod in a pan with cold water until covered and bring to the boil, drain and set aside to cool. To assemble: With the help of a circular mould shape the chickpeas into cylinders. 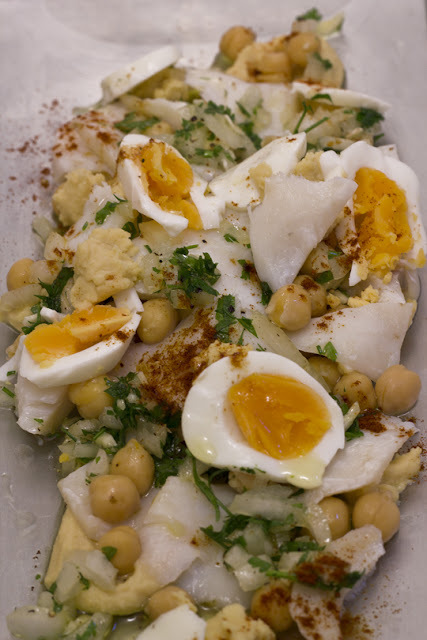 Top with the cod,halved quails eggs and the chunky dressing.Sprinkle a fine carpet of paprika over the top.Serve. There’s a good reason why you never see a leftover devilled egg. Who put the devil in devilled eggs? Througout the years, I’ve eaten deviled eggs every which way. Many were decades-old family recipes that followed some combination of mashed yolks, mayo, mustard and sweet pickled relish. Others were filled with more interesting ingredients like crabmeat, chilli peppers or Old Oak Ham(who remembers?) in the can. Do you remember that stuff? All of them were delicious, even the ones with pickled gherkins– something which which I firmly believe should be relegated to hotdogs! At home, however, I’ve always stuck to my traditional recipe of Hellman’s mayonnaise, Dijon mustard and black pepper. I’ve relied on those basic ingredients just because my mother did and everyone loved them.But recently, I started playing around with my stuffed eggs and discovered that they’re even better with a bit of a kick of chilli eh boys. I love the bite it adds to the creamy yolk filling.So,hey ho what about some home made hummus as healthy option in place of tired old mayonnaise. Place eggs in pot and cover with cold water. Bring to a rolling boil over high heat. Turn off the heat and let sit for 15 minutes. Remove with a slotted spoon and run cold water over the eggs. The eggs are easiest to peel if they're still slightly warm. Also, older eggs peel easier than fresh. Cut peeled eggs in half with a sharp knife, dipping the knife in water between each egg so they slice smoothly. Scoop out the yolks. Reserve 4 of the yolks in bowl of a food processor. Discard the other yolks (or save them as a special treat for your dog!). Add the hummus, roasted garlic, lemon juice, sriracha, honey and salt to the food processor and process, adding the olive oil in small batches until mixture is smooth and easily spreadable. If you're spice sensitive, you might want to start with 1/2 tbsp sriracha and add more to taste. Use a pastry bag with tip to pipe the hummus mixture into the halved eggs (or, if you want to be less fancy, just scoop a bit of the mixture into each egg). Dust the eggs with smoked paprika using a mesh strainer to disperse the spice neatly and evenly. If you have leftover filling, place it in a small bowl for next days sandwich filling. 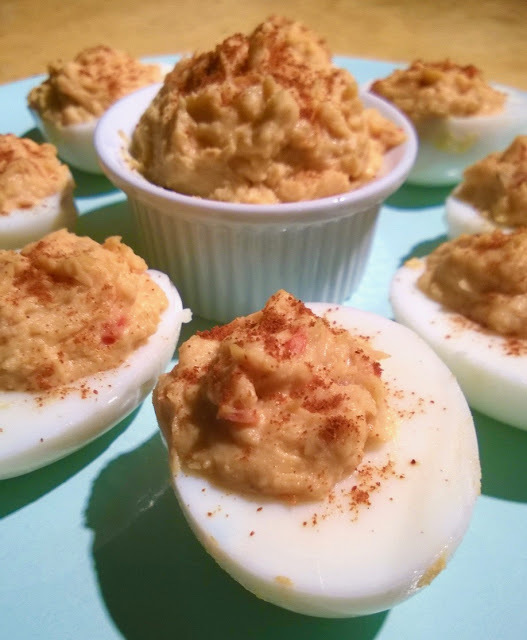 These deviled eggs can be made up to 1 day ahead and refrigerated in a covered container until ready to serve. 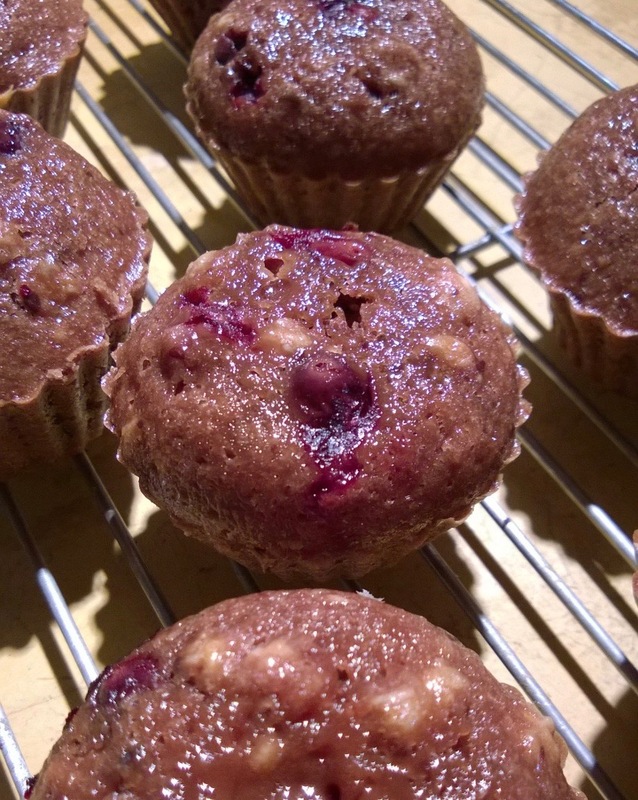 Refrigerate them immediately after making, do not leave at room temperature for very long or they may spoil. Halve the eggs lengthwise. Carefully remove yolks and place in a small bowl; mash yolks with the back of a fork.Add jalapeno pepper, mayonnaise, cilantro, mustard, and cayenne pepper.Season to taste with salt and black pepper. Spoon mixture into hollowed out egg whites. Refrigerate for at least 1 hour before serving. Serves 6. Strictly speaking, anything described as devilled should be spicy, but this bandwagon has run away with itself – like a good catalogue model, the humble egg is versatile enough to take on almost any flavour humanity can throw at it, from simple smoked salmon,bacon or avocado, to hipper-than-thou kimchi.This is good old fashioned finger food with a twist. Cut the eggs in half and scoop out the yolk. Mix in the mayo, peri peri sauce , salt and pepper. Mix well and fill a piping bag with a large star tip. Pipe back into eggs. Sprinkle with a little paprika and pepper. A traditionalist at heart, I have never favoured oven baked risotto,but then again it has certain advantages. This non-traditional risotto is cooked as if it were a gratin,finished in the oven,rather than on the stovetop.This makes it much easier to prepare ahead of time and then finish at the last minute in about ten to twelve minutes.This allows you to watch that instalment of your favourite TV show and still stay calm about getting supper to the table bang on time. The recipe here, once again is adapted from my new inspiration "bread is gold,"It is crunchy on top and soft and creamy in the middle.It is served with a creamy turmeric and crescenza cheese sauce.Crescenza is similar to stracchino.They are both Italian, made with fresh cow's milk cheese.I sourced a Portuguese queijo fresco made with cows milk,but at a pinch you could substitute with mascarpone or ricotta.The original recipe was served up with bresaola that had been dehydrated in the oven and then crushed into fragments,similar to bacon bits and sprinkled over the tops of the individual risottos.Given our location I thought it appropriate to put an Iberican spin on it and serve it with cecina chippings. I found the recipe for the actual risotto a little bland so decided to give it a bit more oomph.My solution was to pepper the proceedings with two elements that I think partner beef perfectly,baby radishes and horseradish.So not much of the original core recipe left.I did say in my first post from this book that it was inspirational and having made a few of the recipes I now think inspirational is the way forward,unless you are feeding the homeless on a mass catering scale. In a milk pan, heat the stock until it begins to boil.Keep it warm on a low heat. Remove the green part of the leek and cut in thin rounds,rinse in a colander under a tap of running hot water running your fingers through the leek turning the rounds over.this accentuates the flavour when you cook it.Shake dry. but without it turning golden.Add the rice and stir. Let it cook for3-4 minutes. Add the wine and stir again. Let it cook until it evaporates. Introduce the stock little by little and cook,stirring constantly ,until creamy,about 12 minutes.Add the radishes,horseradish parmesan,butter salt and pepper and mix to combine.Remove from the heat.Transfer to 5 x 7 cm circumference by 4,5cm deep stainless steel cooking rings.Let cool completely until you are ready to put them in the oven.Carefully remove the rings and arrange the risotto on a prepared baking tray lined with parchment paper brushed with oil.Bake until golden brown 10-12 minutes. Preheat the oven to 200F(100C) or as low as your oven can go.Line a baking sheet with parchment paper.Arrange the cecina on the baking sheet and let dry in the oven for 1 hour.Let cool for 15 minutes,Crush into small chippings. Lost in translation, NOT.Undelivered promise,YES. Its as bad as a government making promises they cant keep.Well the "best of British" to that one.But it seems the Germans can´t deliver either,The promise of a warm chocolate and blueberry muffin on my plate for breakfast was not to be. 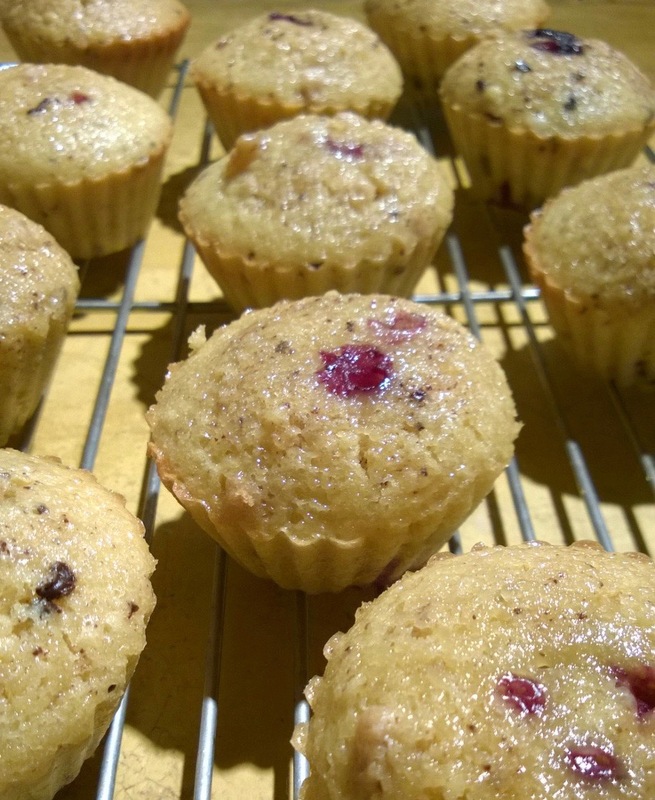 A blueberry muffin is a simple pleasure. They have always been hugely popular in cafes, breakfast bars and recipe books across the globe, and making blueberry muffins at home is easy, as punnets of fresh blueberries are readily available in shops.As the supermarket titans continue to entice us, it is not uncommon to see blueberries included in super-saver deals. Because blueberries freeze so well, it’s worth stocking up when you come across these deals. 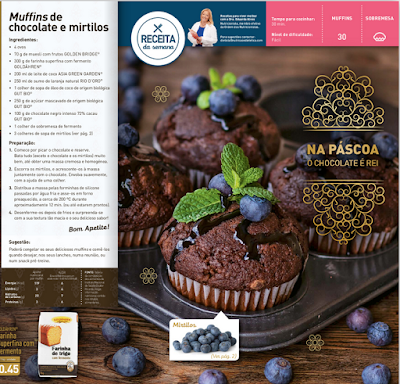 "Come Easter, chocolate is king",proclaimed the strapline on the recipe of the week in a recent Aldi promotions leaflet.Accompanied by some mouth watering photography of Chocolate muffins oozing deep purple juice and topped with fresh blueberries and sprigs of mint. 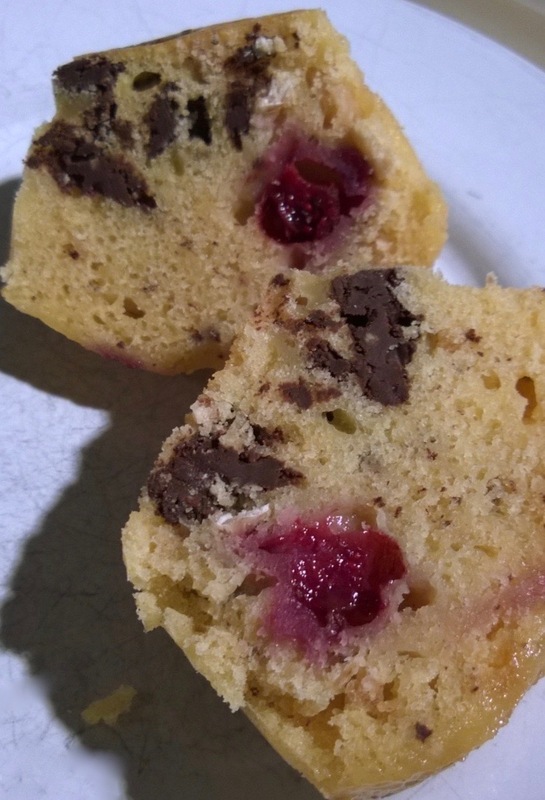 Blueberries and chocolate chips in one muffin? Yup. Why? Because it’s good. That’s why. Another reason why? Because I love both chocolate chip and blueberry muffins. So why make two separate muffins when you can just roll them into one? Perfect I thought.I purchased all the necessary ingredients cited in the recipe which came to a total of €14.28 to yield a promise of 30 delicious muffins.Having followed the recipe meticulously, no meddling here mother,it was not until I was at the stage of pouring the batter into the muffin moulds that I realised the recipe was not going to make the promised chocolate muffins.If one followed the recipe as I did one would end up with regular blueberry muffins with chocolate chips. Never one for waste I re-made the muffins which incidentally only yielded 20 not 30 as cited on the recipe.I made a second batch and now added cocoa powder to my batter.This time they delivered chocolate muffins,an approximation of the picture in the recipe but not half as luscious. Both batches fell way short of their aspirational image.Fresh out of the oven, the chocolate chips were melted. The sweet and tart fruit juice of the burst blueberries was soaked throughout the muffins. The muffins were not the best and certainly not worth the 70 cents unit cost.In the words of AlDi´s own mission statement "Quality should not come at a high price; rather, great quality should come with everyday low prices".I dont think so Herr Albrecht, you did not get my vote on this time round. I contacted Aldi customer services to inform them of the fact that their published recipe did not work and included photographic evidence.They replied immediately claiming that all their recipes are the creations of their nutritionalist Dr.ª Eduarda Alves and that all her work is tested before publication.I replied suggesting that they had the recipe re-tested and that I was very disappointed in their lack of responsibility.I have received no further response from them. Oh my cod!! Fish and chip pie.Gimmick or gourmet gorgeous? I´m all for trying new things and this is a classic with added pastry! Take two British staples, Fish and chips and pie.The mouth watering prospect of a mixture of two traditional favourites of British cuisine sharing one plate, in principle, seems great. How many of us have put a dinner on the table for friends and claimed that we made it ourselves,when if the truth be known It was a Marks and Spencer ready meal.Well here is the situation in reverse,You steal the recipe of one of the aforementioned store´s best sellers,and make it yourself at home and probably took only a little more time to make than if you’d bought one and baked it for 35 minutes.So whether Remainer,Brexiter, frustrated expat or someone just wanting to dabble in a bit of British tradition,here´s one for you.Such fun!! In the all-butter shortbread pie crust, we have a minted pea puree (mushy peas) topped with cod chunks in a tartare sauce and and topped off with a chip ‘lid’.Start with the tartare sauce.The point of tartare sauce has always been to provide a piquant contrast to the mild-tasting food it accompanies. In one knife-sharp hit, this sauce of egg, gherkins, mustard and capers continually sharpens an appetite that would soon be dulled by mouthful after mouthful of crumbed or battered food. Traditionally the sauce exists to put some much-needed spark into fried, crumbed or battered fish. 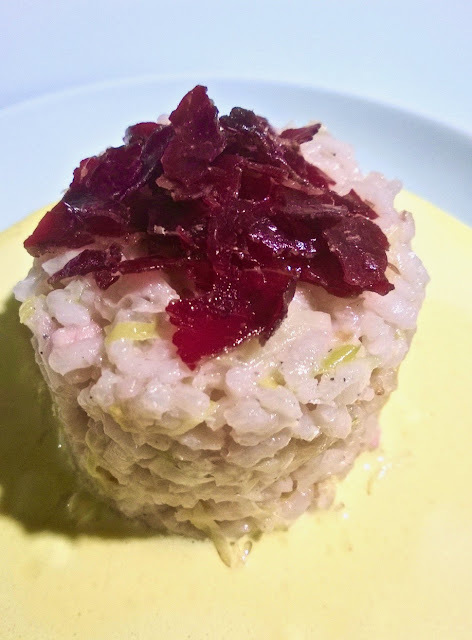 After years of service in the dented sauceboats of hotel dining rooms, tartare made its bid for wider appreciation with a brigade in the 70´s who pub lunched on scampi in a basket. But history has not been kind to our classic and if we are not mindful, accompaniments like this one will be in danger of becoming a rare species.The secret here is in finding the correct balance between piquancy and creamy blandness. Too much vinegar or lemon in the mayonnaise and the result will be harsh; too few capers or gherkins and the essential piquancy will be lost.While the exact ratio is a matter of taste, the sauce needs an unmistakable tang. Start by making a small quantity of classic bechamel (quantities above) Stir in the egg yolk,Dijon mustard,lemon juice, rinsed capers and chopped gherkins, plus 2 tbsp of chopped parsley. Check the seasoning – you want it to be piquant, but not acidic. 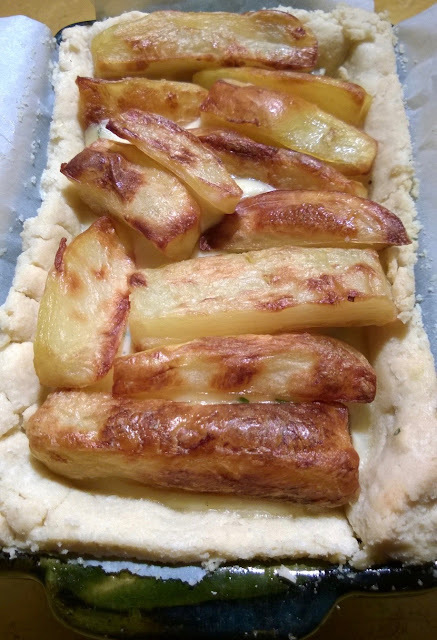 Make the chips by cutting enough potato to cover the top of the pie dish with chunky sized chip shapes. Then boil the potatoes in a saucepan of water for 4-5 minutes. Bake in an oiled dish in a hot oven for approx 30 minutes, stirring regularly. Meanwhile, roll out enough shortcrust pastry to line your pie tin. Prick the base and inside edges of the pie with a folk. Line the inside of the Pastry with greaseproof or parchment paper. Pour in some baking beans and blind-bake for 15 minutes. Also bake the Fish (cod fillets) in the oven on a grill tray for 15 minutes. Meanwhile, make the mushy peas by cooking the Peas in a saucepan of boiling water for 5 minutes. Then drain from their water. Return the Peas to the saucepan, add some butter and mint then mash until you’re happy with the consistency. Once cooked, remove everything from the oven and remove the baking beans from the pastry case. 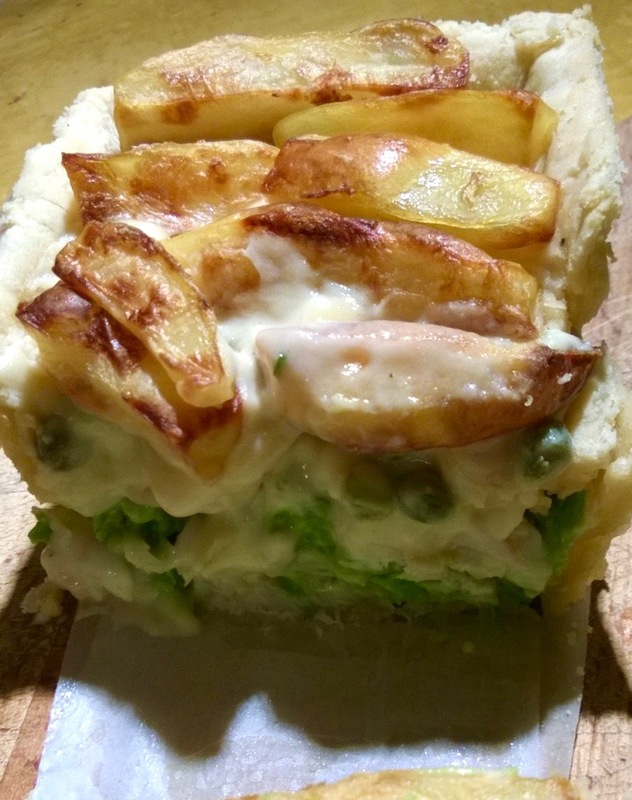 Construct the pie by layering in the Mushy peas, Fish, Tartar Sauce, then top the pie off with the Chunky Chips. Finally, place the pie back in the oven for a final 15 minutes to finish baking. When the pastry turns golden and the chips are crisp, remove from the oven, cut the pie in half and serve straight away. 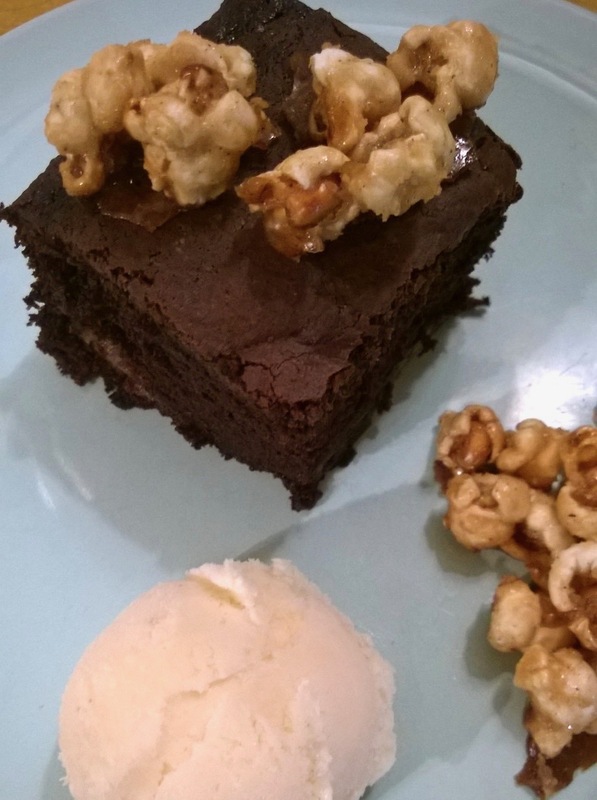 Popcorn is finally out of the cinema and taking mainstage, wowing gourmet adult audiences around the world.These retired kernels in our storecupboards are popping up on smart restaurant menus all over the place,urging us to get creative and have fun. It's easy to go overboard popping popcorn for a netflix movie night in, or trying to create the futuristic nostalgia of "drive-in saturday", but instead of tossing leftovers in the bin,try "a crash course for the ravers" and transform them into pesto or create a side for some soya dipped chicken skewers,even caramelise them and serve them over chocolate cake with ice cream. In a large pan,heat the oil over a medium heat.just as the oil begins to smoke,add the popcorn kernels and quickly cover with a lid.Vigorously shake the pan while the popcorn begins to pop.Once the popping begins to subside,remove from the heat and continue shaking for about a minute.Remove the lid and let cool.Discard any unpopped kernels.transfer to a food processor and pulse until crushed into medium pieces. and toss to coat.Refrigerate for about 20 minutes. remove the chicken from the marinade and transfer thew marinade to a small saucepan.Heat the marinade over a low heat and cook to reduce by half,until thick enough to coat the chicken,about 6 minutes. Meanwhile,thread 6 pieces of chicken onto each skewer.On a grill(griddle) pan over a medium high heat,sear the skewers,turning occasionally and brushing with half the reduced marinade,until browned and cooked through,but not dry,about 10 minutes. 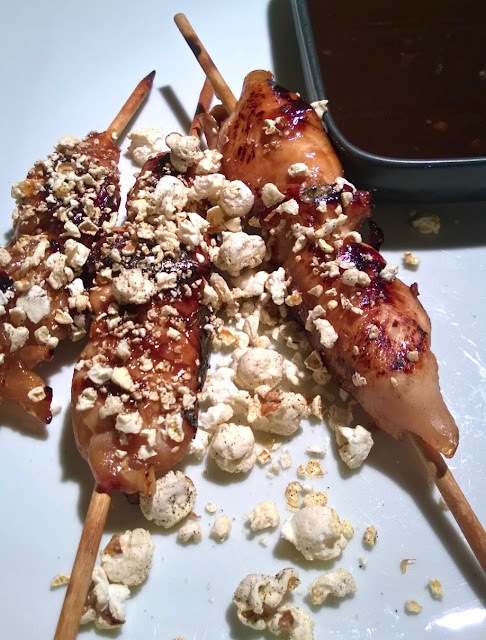 To serve,arrange the skewers on a serving dish and serve with bowls of the remaining sauce and crushed popcorn for dipping. Heat the oven to 130C (120C fan)/285F/gas 1and line a large oven tray with baking paper. Put the oil in a large saucepan for which you have a lid, put on a medium heat and, once it’s quite hot, add the popcorn kernels and cover. Leave all the corn to pop, shaking the pan frequently, about five to six minutes, then tip into a large bowl and transfer about a third of it into a second bowl. Melt the butter in a medium saucepan on a medium-high heat, then add the sugar and cook, stirring, for two to three minutes, or until foamy and bubbling. Add the salt, baking powder, chilli and sriracha, and stir vigorously to combine; the mixture will bubble profusely, so take care. Turn off the heat and stir in the shrimp. Working quickly now, pour the caramel over the larger bowl of popcorn and mix to coat. Transfer to the prepared baking tray, spreading out the coated popcorn as much as possible, then bake for an hour, stirring two or three times, or until the popcorn is no longer sticky. Remove, then leave to dry out and cool completely – about 15 minutes. 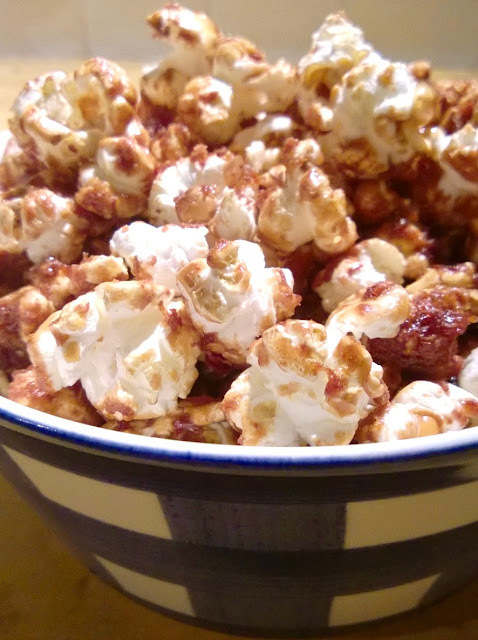 To serve, transfer the spiced popcorn to a large bowl, stir in the reserved third of unspiced popcorn and add an extra sprinkling of flaked salt, if you like. Preheat the oven to 350ªF(180ªC,Gas mark 4).Butter a 9 inch(23cm) square baking pan and dust with flour. In a medium bowl,sift together the flour,baking soda and salt.Set aside. In a heatproof bowl set over a pan of simmering water,melt the butter and the chocolate.transfer to a large bowl and add the sugar.With an electric mixer,beat on medium-high until homogenized.Add the eggs and continue beating until combined.Stir in half the flour mixture,then half the milk,alternating between the two until combined.fold in the pears.transfer to the prepared pan and bake until a skewer inserted into the centre of the cake comes out clean,about 45 minutes.Let cool in the pan on a wire rack for 30 minutes. In a medium pan,warm the oil over a medium heat.add the popcorn kernels and quickly cover with a lid.once the popcorn begins to pop,vigorously shake the pan.Once the popping begins to subside,remove from the heat and continue shaking for about a minute.Remove the lid and let cool.Discard any unpopped kernels.Spread out on a baking tray lined with parchment paper.in a small pan.heat the sugar over a medium heat until melted and golden brown,about 2 minutes.add the cream,butter,and salt and stir until combined.Pour the caramel over the popcorn and let sit until hardened,Break into chunks. Heat the milk with the vanilla pod until almost boiling, remove from the heat, stir well and leave to infuse for 30 minutes. Whisk the egg yolks and sugar together until pale and creamy in a roomy bowl. Slowly pour on the milk, stirring constantly. Lift out the vanilla pod and return the mixture to the pan. Stir constantly over a low heat until the custard is thick enough to coat the back of a wooden spoon. It must not boil or it will curdle. Remove from the heat, stir in the cream and leave to cool completely. When cold, using an electric whisk, whisk the custard into the mascarpone then chill. Freeze in a freezer box and freeze firm, stirring once after 2 hours and twice more at hourly intervals. Transfer the ice cream to the fridge at least half an hour before serving. Nothing personifies spring for me more than the new season´s produce.Spring leeks,spring onions, spring greens,broad beans asparagus and peas, all these signify the arrival of the season of birth and nature´s reawakening.To celebrate the arrival of spring here is a plate I have christened "Primavera." 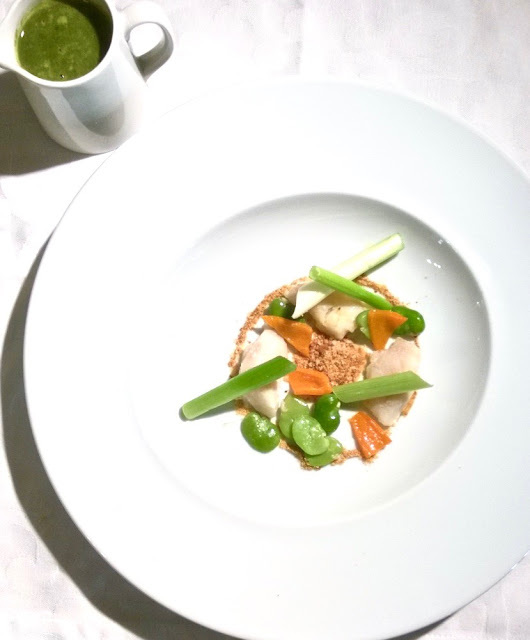 The challenge of preparing spring vegetables is always in preserving their fragile colour, texture and sweetness.Ones approach is to sautée them gently with onion, garlic and olive oil; the vegetables cook gradually in the water they render. Since the cooking time for each one varies, simply add the next vegetable when the previous one has lost some of its crunch but is not softened to the core; the flavours will remain distinct yet also blend harmoniously. 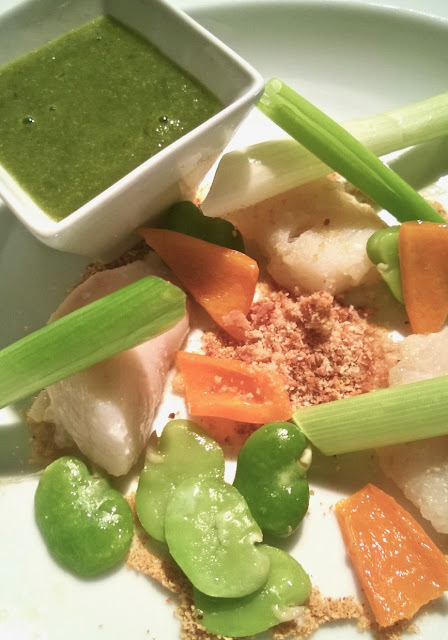 Spring vegetables are most flavoursome when served lukewarm.With my new found discovery,cod cheeks this plate was designed to chase away the last grey clouds of winter and bring a bit of colour back onto the palate. Slowly mix everything together in a mixing bowl for four minutes, then knead quickly for 6 minutes. Let the dough rise for half an hour, then place in a brioche-form (21cm /8" )and let it rise again for another half an hour. Bake 30 minutes at 180°C. Allow brioche to dry out, grate finely and season with 10g hot curry powder. Peel the beans, blanch, shell and fry in olive oil with the diced peppers. Halve, wash and cut leek into 2cm large segments. Peel onion and cut into cubes. Mash the garlic. Sauté onion and bacon in butter, add leek and garlic and sauté as well. Pour in chicken broth. 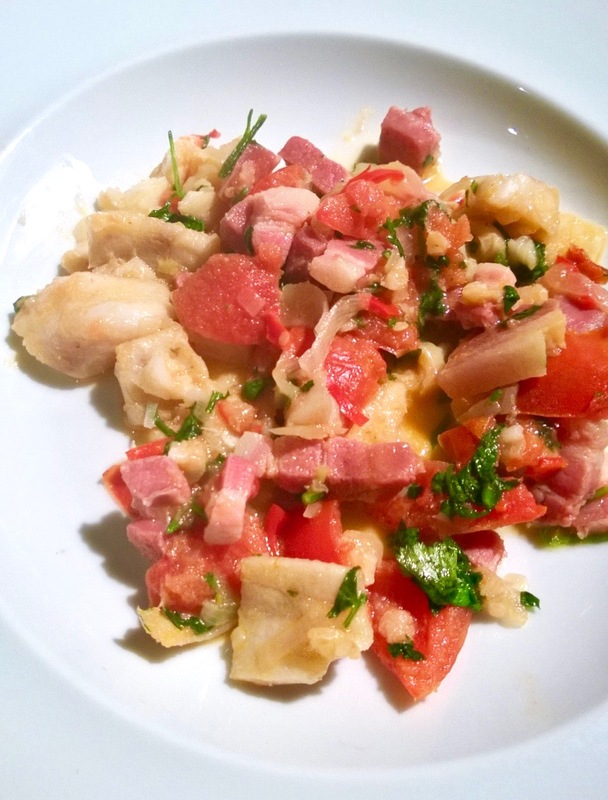 Let cook until vegetables are soft, remove bacon, mix and pass through a sieve. Add cream and season to taste with salt, pepper and nutmeg. Place a circular pastry cutter (12 cm) in the centre of a soup plate and carefully spoon a light circle of crumb around the inside circumference,pushing the crumb with a teaspoon to get a neat edge.Make a pile of crumb in the centre of the circle.Remove the pastry cutter and carefully place the cod cheeks equi distant apart on the edge of the circle.Rest the spring onion quills on the cod cheeks and scatter the rest of the vegetables within the circle.Serve the soup on the side in a jug or similar vessel and let each person pour the soup over the assemblage. sizzling in a very hot pan until caramelised on the outside, yet sweet and juicy in the centre. And the taste is a mild and sweet pleasing fishy one, made even more tasty through frying.The beauty of them is that they have no bones, so can be used in things like fishcakes without having to faff around picking through the meat. I am a little unsure however, despite their goodness, of the ethical issues regarding cod cheeks - cod has a lot of sustainability problems. I am wondering if it's good to eat the cheeks because they're a by-product of the cod process, and would be going in the bin if we didn't eat them (there is still a demand for cod, like it or not, and I suppose we may as well make the most of the whole fish if we're going to be catching it)...or if I should stop buying them and decrease demand for this endangered fish. Any ideas? As for recipes, the best are the simplest.You can treat cod cheeks pretty much the same as any other when you’re cooking them.The best combination perhaps being with bacon and a tomato sauce.You will need about 300g cod cheeks for two, 5 or 6 each depending on their size.Now it’s time to throw your cheeks into your frying pan. Keep them there until one side turns golden brown, then flip to achieve the same effect on the other. The resulting meal is one of perfect texture variation, a crisp crunch covering up soft, flavoursome meat that comes apart easily in your mouth, topped off with the juicy, salt burst of the bacon and the contrast of the sweet tomato sauce. 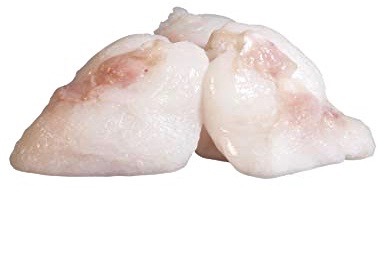 In spite of their roots as the throwaway parts of the cod, cod cheeks have become a delicacy.Cod cheeks exemplify a classic, poor man’s recipe gone haute, a once cast-aside organ playing dress-up. Finely chop a small onion and a medium size red chilli,de~seeded.Cut 150g of smoked bacon into small dice, each piece measuring roughly 2cm. Warm 2 tbsp of olive oil in a frying pan, add the onion and bacon and let it cook over a moderate heat, stirring regularly, until the fat starts to turn a translucent gold.add the chilli and continue cooking for a couple of minutes. Pull the leaves from 3 sprigs of thyme or lemon thyme and add them to the pancetta. Cut 2 large tomatoes into small dice and add to the bacon. Continue cooking, stirring regularly, and then add 300g of cod cheeks. Roughly chop the leaves from 3 or 4 sprigs of coriander and stir in together with a light seasoning of salt and black pepper. Continue cooking for 3 or 4 minutes until the cheeks are cooked and the sauce is thick and brick red. Serve immediately. I´m a self-taught cook.From my childhood in Scotland through growing up in South East England, my mother was my formative influence. 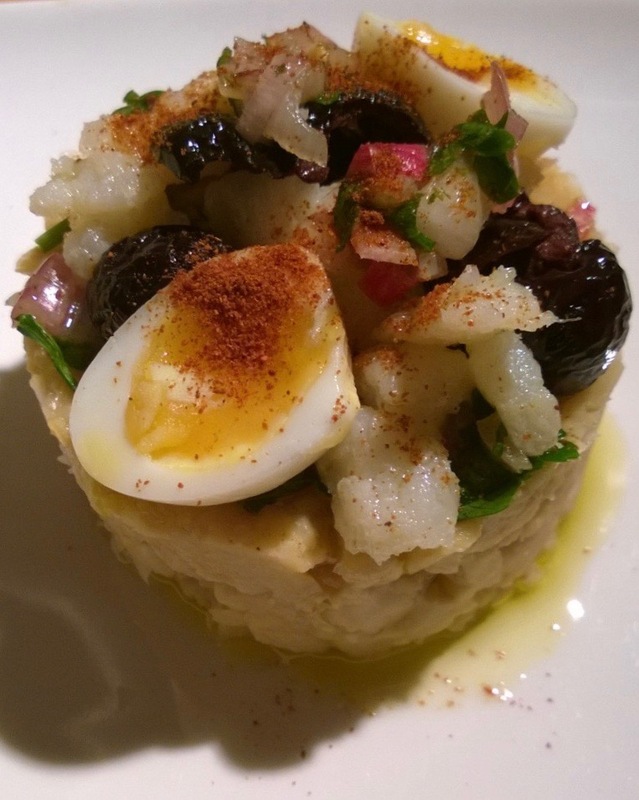 Holidays in Europe, America,Africa and Scandinavia fed me with culinary inspiration. Fifteen years of holidaying in Tavira, led me to up roots and follow the dream to live in Portugal. Here in Castro Marim we run a small guest house, Casa Rosada.Relocation has opened my eyes and taste buds to how recipes and their ingredients can change and develop when incorporated into another country´s food culture and how foreigners like myself adapt the local dishes,bringing a new slant to them.In the last three years I have been researching and cooking traditional Portugueses dishes and then inventing a modern twist to them. I´ve started this food blog so I can share new recipes and a slice of Algarvian life here at Casa Rosada here in Castro Marim.